Devoid Of Culture And Indifferent To The Arts: Recipe: The Golden Round. Pizza dough you can trust. Recipe: The Golden Round. Pizza dough you can trust. There’s not really that much of an art to pizza dough. The secret is in finding a recipe that delivers time after time. I’ve tried many with different results. The slightest shift in ingredients will result in a disproportional shift in your final result. I’ve finally found a crust I can trust and I return to it often. It’s become a staple. I’m partial to honey crusts. They seem to brown differently than unsweetened recipes. They also seem to give a crispier end result. The honey crust recipe below is one arrived at from trial and error. In the 16th Century tomatoes had made their way to Europe from the New World and quickly became incorporated into the diet of poorer Italians who often had little more than olive oil, cheese and herbs as staples. 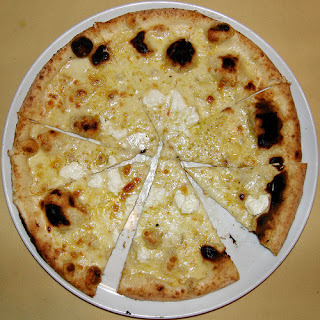 Within 100 years, Neopolitan pizza had achieved a popularity among visitors to Naples that they would make special trips into the poorer, and more dangerous, sections to taste this dish made by cooks called "pizzaioli." 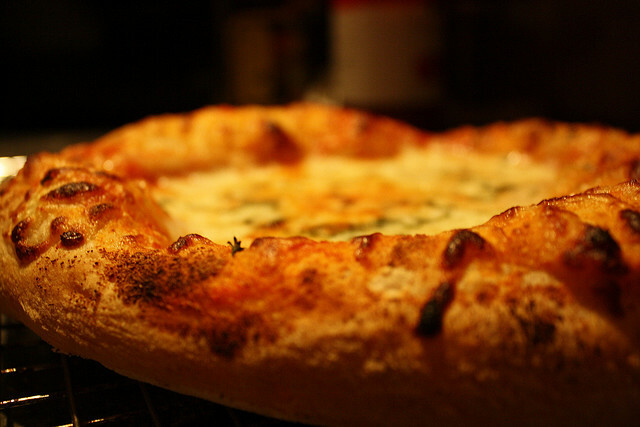 Naturally, pizza came with Italian immigrants to the shores of their adopted homelands in North America. 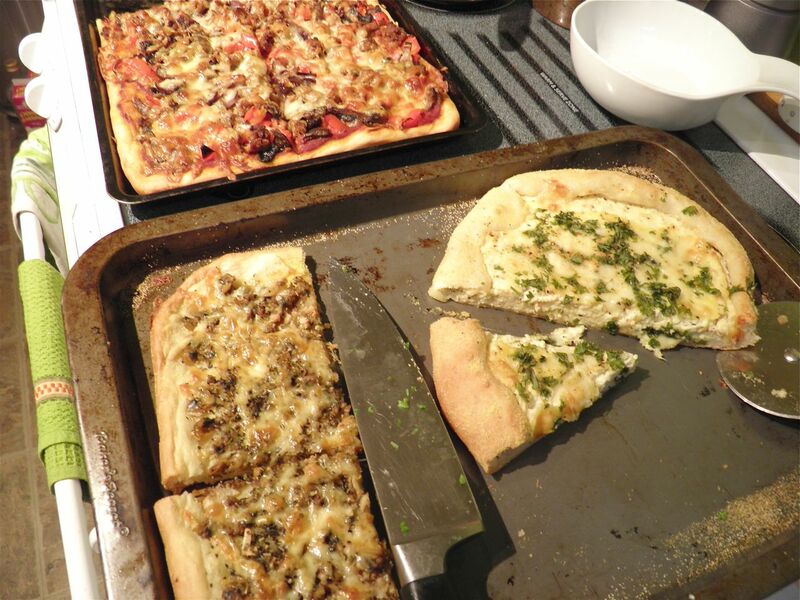 No doubt great debate often arose over the quality of, and differences in, their crusts. Toppings vary as wide as imagination will take you, including “blonde” and no sauce varieties. I’ll outline a few out of the ordinary ones after the following recipe. It’s not a quick crust, but it’s a good all purpose crust and gives a great result. The recipe calls for a 2 hour rise in a warm place. I sit the dough on the top of one of our hot water radiators. But I have also mixed the dough just after lunch and let it rise on the counter for the afternoon while we were out doing errands. It rises more slowly when cooler. It's then ready to use by the time you're home for dinner. Proof the yeast in a bowl with the honey and water. Place in a warm spot, covered with saran wrap, or place the whole bowl in a tied plastic grocery bag. Let sit until bubbly. This will take about 15 minutes. 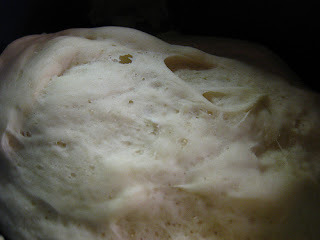 If the yeast hasn’t become active start again. Tip: You can store yeast in the freezer for far longer than than in the cupboard. We have a large container in our freezer right now. Several cups of yeast actually, bought in bulk. After more than 2 years it still proofs every time. After the yeast has proofed, add in the remaining ingredients. Bring together in the bowl and knead briefly. The dough should be soft under your hand. If it is very wet, add a little flour. It should feel “moist” but not stick to your hands. Cover tightly and let rise in a warm place for 2 hours. After this time the dough will have risen significantly. Knead gently for a few minutes. If it is still too sticky, add a tiny bit more four. Divide in two and press out to prepare according to your recipe. Let rest for 15 more minutes before adding toppings. If it has risen a lot after pressing out, dimple the crust with your fingertips. A standard baking time, with toppings, is 20-25 minutes at 425°F. It should be browned on the bottom. Scatter a little cornmeal on a lightly oiled pizza pan. Press out the dough. Let rise for 15 minutes. Brush the dough with half the olive oil. Sprinkle the garlic and clams over top, then add the cheese and spices. Sprinkle the remaining cornmeal around the exposed crust edge. Drizzle the remaining oil on top. Bake as directed above. Lightly oil the pizza pan. Press out the crust and allow to rest for 15 minutes. Mix the ricotta, parmesan and romano with the eggs, basil and oregano. Pour into the rested crust. Flip then outer edge of the crust up over the filling to about 1-2 inches. This keeps the filling in place. Tear the mozzarella into small(ish) chunks and scatter on top with the parsley. Dust the crust with the cornmeal and bake as directed above. Lightly oil the pizza pan. Press out the dough and let rest for 15 minutes. Spread with the pizza sauce. Then layer on the artichoke and salami. Sprinkle with the provolone. Bake as directed above. 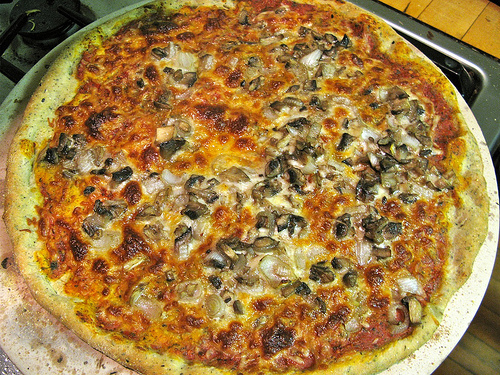 From right: quattro fromaggio; vongole; andouille, red pepper, onions and mushrooms.